The Company’s recruitment of Japanese mercenaries was driven by a powerful idea, that the Dutch could make up for their perennial lack of military manpower by recruiting directly in Japan. Seeing Japan as a space where European dreams could be realized was nothing new. Religious orders like the Jesuits saw Japan as a zone of infinite possibilities where fantastical dreams of conversion could be realized. With minimal expense and only a small number of personnel, the archipelago could yield an army of converts, who could be used to Christianize not simply Japan but to march outwards in service of Jesuit aims. The Dutch made no effort to convert the Japanese and there was, at least in this period, no Protestant equivalent to the Jesuit dreams of mass proselytizing. But Dutch East India Company officials were equally optimistic about what could be achieved in Japan. Just as a great harvest of souls was confidently predicted by the Jesuits, Dutch officials anticipated a great harvest of willing bodies. Rather than an army of Christian converts able to carry the fight to the heathen, they saw the possibility of thousands of ferocious mercenaries marching outwards in service of the Company’s strategic aims. And just like the Jesuit fantasy, it was a dream based more on an illusion that anything of real substance. 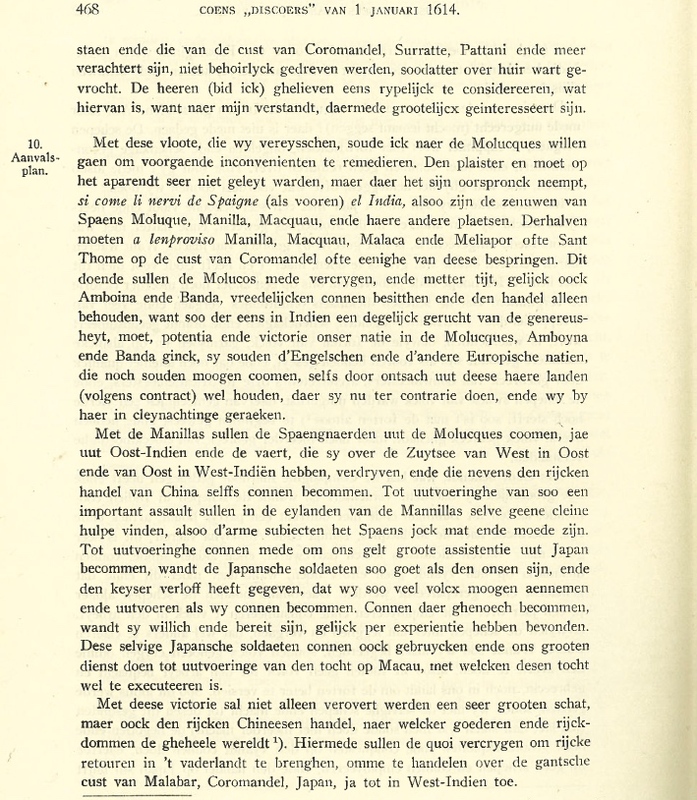 This excerpt comes from a bold plan presented for the Dutch empire in Asia by Jan Pieterszoon Coen, who was Governor-General first from 1619-23 and again from 1627-29. Coen was a firm believer in the value of Japanese mercenaries and he dispatched a string of letters to his subordinates ordering them to recruit as many of these soldiers as possible. Japanese soldiers featured in his most ambitious plans. Rather than being condemned to the defensive, the Company should, Coen wrote, go onto the attack, striking at the great Iberian centers of power: the bustling Portuguese entrepot of Macao and the heavily fortified Spanish colony at Manila. The key to this multipronged assault was the participation of large numbers of Japanese mercenaries. For the execution [of the assault on Manila] we can get great help from Japan, because the Japanese soldiers are as good as ours and the emperor [shogun] has given us his promise that we can take out as many people as we can get hold of. We can get enough as they are ready and willing, as we have found from our experience. These same Japanese soldiers can be used to do great service in the expedition to Macao, and with whom this expedition can be successful.